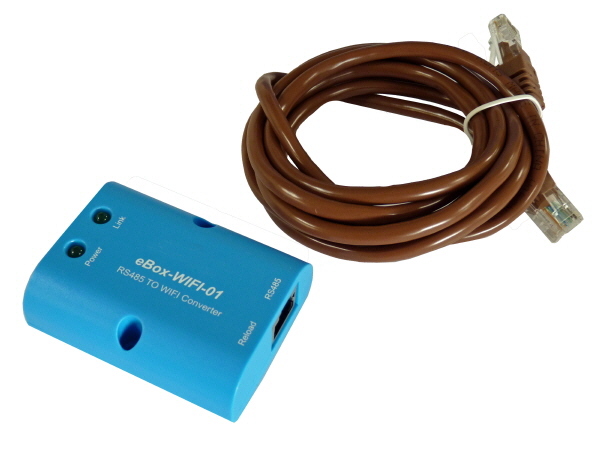 This Wi-Fi module plugs into compatible solar charge controllers or Power Inverters (see list below) and creates a Wi-Fi network. Then using a Android mobile phone with the free Android app, you can connect to the Wi-Fi network created and monitor parameters of the solar charge controllers or power inverters. The mobile app allows you to have full control over the charging process on the Solar Charge Controllers, and can display various charging parameters such as voltage, current (separately for solar panel / load), battery state of charge etc. It can also store accumulated charge and discharge energy, as well as min / max voltage readings. The Load output can also be controlled within the parameters of the connected Solar Charge Controller. When used with a compatible Power Inverter the app will allow remote switching and power/voltage monitoring. Connecion is via a standard RJ45 network cable (supplied). Power for the Wi-Fi module is supplied by the Solar Controller/Power Inverter and is low consumption.